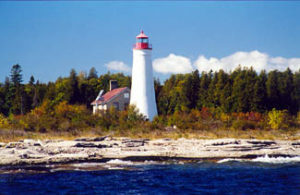 One of the oldest light stations on Lake Huron is located on Thunder Bay Island, situated within the boundary Thunder Bay National Marine Sanctuary. Thunder Bay is the outermost island in a group of islands connected to the north point of Thunder Bay by a shallow bank of numerous rocks, most of which are submerged. ed for years. Access to the island is limited to the U S Coast Guard, U S. Fish and Wildlife Service, and members of the Thunder Bay Island Preservation Society. Contact the preservation society at (989) 356-6743. The station was placed on the National Historic Register in 1984. The lighthouse is not open to the public but can be viewed via boat from the water.